Sharma Omar Geelaani is a 23 years old man and a former street-child, prior to joining the children’s care Centre he was in streets for several years, he states that he joined the centre after being advised by Youth Employment Solutions (YESO), in the centre, he was provided with shelter, food and clothing, things that were hard to come by in the streets, he affirms that he was so happy to join the Centre in 2009,because learning opportunities were also there, for instance Quran and general Islamic studies were taught in the Centre, he confirms that life in the streets was hard and he had become addicted to drugs as a results of hardships. He states that in the year 2011 and 2012 YESO took him to youth rehabilitation centre (YESO youth centre), where he got psychosocial counseling and other courses like social studies, LSBE, ICT, recreational activities and also mentorship classes. He says for now he is focused and has ambitions in life to fulfill. 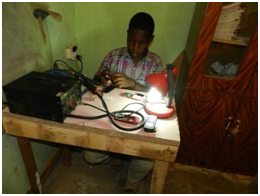 He confirms that September 2012 was a turning point for him, “I was lucky to be selected as one of the beneficiaries for the skills training project which was being implemented by YESO, several skills training was being offered but I chose Mobile-Phone repair”.The training ended in February 2013, during the training, he says apart from Mobile-Phone repair training, they were trained on business skills, he is also utterly grateful to funding agency for the start-up kits they were given after the training. He says that after being given the start-up kits, he didn’t have money for starting the business, he took the kits to home and started to look for job in order to raise some money for the business, “finding the job was so hard but I was hopeful, one day I received a call from YESO informing me about the internship program, I was so elated”. He says that in November 2013 he joined internship program, where with the help of YESO he was given a space to operate in by one of the businessman in Bossaso, who has a bookshop (Al-Towba Bookshop), that’s is where I am still operating from, he affirms that through business skills that he was taught, he has managed to attract many customers. “YESO agency has been giving me monthly salary and I am very grateful, my salary is $ 80 but in addition also get some amount from what I am doing, in a day I get $15-$20 and I am saving the money in order to open a room of my own and to fully invest in the business”. He is so thankful to YESO, and to everyone who has accorded me help in one way or the other, he says, he is whom he is today, because of the help and assistance he got from them, he is very optimistic of being a successful business man and a respectful member of the society and he promise to reciprocate the help he was given to others in need.